LOS ANGELES, CALIFORNIA — Cucamonga Peak's 8859-foot summit lies a mere three horizontal miles from the foothill city of Upland, California, one vertical mile below. No other major summit in Southern California exists in such close proximity to the urban sprawl of the Los Angeles Basin. Perched alone at the southeastern edge of the San Gabriel Mountains, Cucamonga Peak comprises a wild borderland of technical alpine terrain floating over the endless grid below. I'd sped past Cucamonga Peak on the nearby 210 freeway many times, always craning my neck to scout the mountain's imposing outline. Cucamonga is the highest and the closest of the San Gabriel Mountains' so-called 'front range' summits. 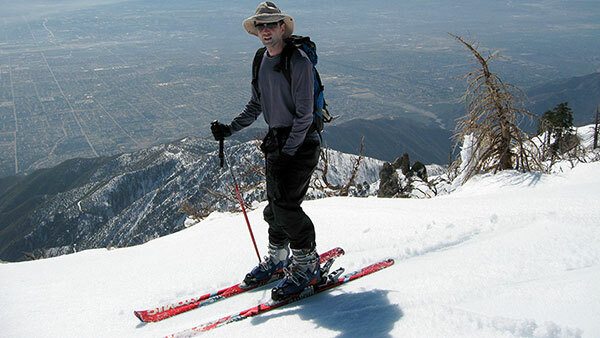 Unlike the taller summits of Mount Baldy and Baden-Powell to the north, Cucamonga is part of a ridge of summits (including Ontario Peak) that rise directly adjacent the Los Angeles basin. This creates a unique combination of altitude, terrain, and prominence that make Cucamonga Peak a natural objective. But Climbing Cucamonga is not an easy task. The peak is remote, relatively isolated from the rest of the San Gabriel range, and somewhat lacking when it comes to direct access. Moreover, the terrain is extremely rugged, even for the San Gabriels. Viewed from the south, Cucamonga Peak presents a variety of steep, rocky faces, narrow gullies, and long, jagged ridges—plus a generous helping of big, crumbling cliffs. As you'd expect in a Southern California sun-exposed aspect, the slopes are nearly always snowless. Still, each time I drove past, I couldn't help admiring Cucamonga Peak's technical terrain, and dreaming of skiing it. What would it feel like, I wondered, to fly across snowy steeps overlooking the whole of the Los Angeles Basin? The thought of carving smooth turns in such dramatic proximity to the city was positively irresistible. And so, with each passing winter, I waited, and waited, and the south face remained unskiable, and Cucamonga Peak rose steadily on my list of fantasy summits—even as I doubted if it would ever get a chance to ski it.